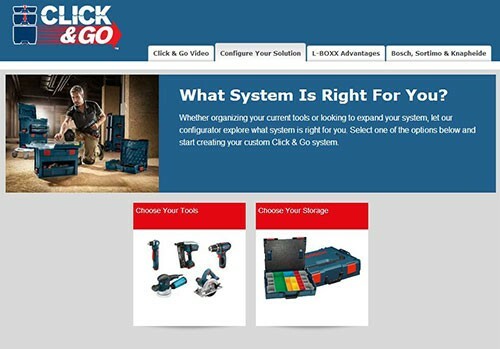 Whether you are looking for Bosch tool kits that include an L-BOXX, 12-volt tools with inserts that fit into an L-BOXX, or just an empty L-BOXX, the configurator has you covered. The 12-volt tools are small enough to fit two into one L-BOXX, and the config tool can help you out there too. Once you have all your items selected, the final page will output your selection list with stores that sell all or some of the Items—it even lists the prices, so you can compare right there. Bosch did a pretty good job on the configuration tool, but it could be better. Some of us already have 12V tools that didn't come in the L-BOXX. It would be nice if the config tool listed just the inserts that are needed to make them L-BOXX compatible. It also doesn't list Bosch's 12V tools and tool sets that already come with L-BOXX cases. These sets are cheaper to buy than buying the tools and L-BOXX cases individually.